Being a mom to 4 kids, running everyone around, taking care of the household, cooking meals, cleaning up…everything, oftentimes I find that I put myself and especially my health on the back burner. There just doesn’t seem to be enough time in each day to take care of all that I have going on and take care of myself. Recently, I’ve decided that I am front-burner material. If Mom is not feeling good and healthy, then nothing seems to run right. I’ve been trying to make sure that I take some time to sleep more and exercise frequently (I know it seems impossible), and also to eat healthy. 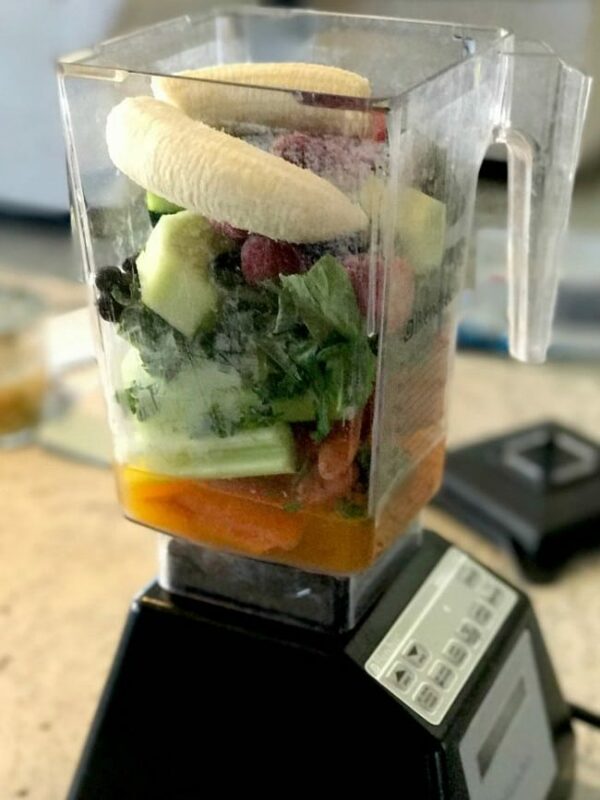 I started making whole juice smoothies whenever I need a boost of nutritious food (and maybe my kids are eating frozen waffles, or chicken nuggets, etc.) and I couldn’t/wouldn’t take the time to make myself a completely different meal. I wanted all the nutrition of the fruits and vegetables, also the fiber, without eating a bowlful of raw vegetables (have you ever tried to eat plain kale? not that fantastic). They have become one of my favorite go-to meals. It fills me up, and I honestly feel great afterwards. There are even days where I make three smoothies (one for each meal) and I’m still not sick of them! I’ve perfected my basic recipe, and I’ll mix it up with one of the options here and there for some more flavors. Make sure you have a powerful blender. The blender can really make a difference. Mix it extremely well (mine takes about 45 seconds). Add 2c ice and blend again. 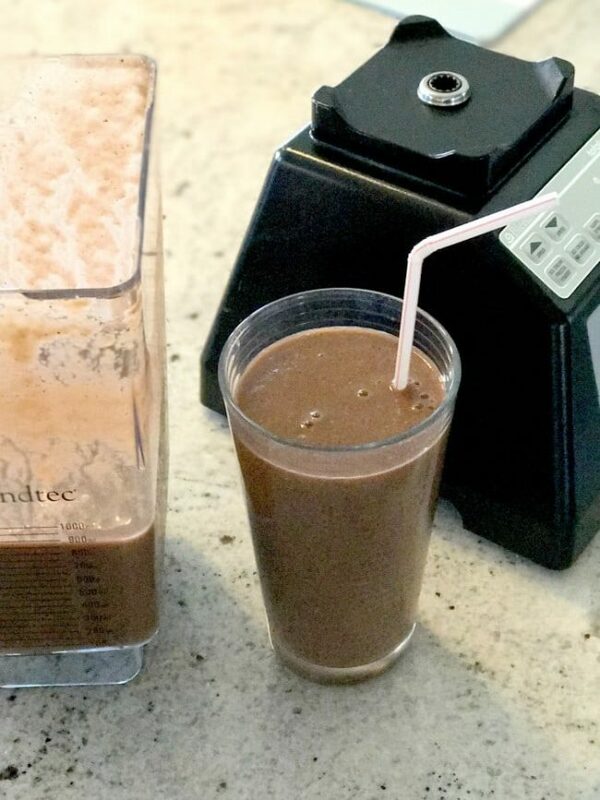 The color changes depending on what you put into it, and sometimes it does not look the prettiest, but they taste delicious and you are getting amazing nutrients in each power packed smoothie! I’d love to hear what different whole juice smoothies you come up with! Previous Post: « I Wiggle Song – Printable Body Parts Variation! This reminds me that I need to juice again. I have gotten away from it for a while. Thank you for the reminder. I make smoothies all the time with coconut milk, frozen berries, and water. I should totally try a cucumber! I bet it would add the liquid equivalent to the water, with some added nutrients also. YUM!!! My kids love smoothies, they’re perfect for any time of day and always filled with delicious things!! This looks so delicious!!! My kids would actually drink this too! I want one too! What a great way to start the day! Yum, the kids love smoothies. Thanks for the recipe! It looks like a chocolate smoothie to me! Definitely trying this one! I love having smoothies for breakfast! I like things that I can take on the go and enjoy as I’m running the kids to school. Taste is what counts if you ask me. It looks like a chocolate shake – that’s what you tell everyone. I need to try this smoothie. I find myself missing breakfast at times because I am so busy. This would definitely save time for me. What a healthy smoothie. I love the produce you used! This has all the right stuff! I really should make more smoothies like this and leafy greens should be a priority. I LOVE adding frozen berries to my smoothie! 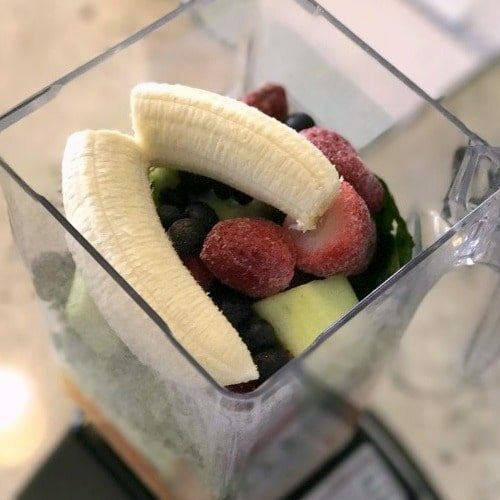 Adding this to my must try list as I put my new blender to good use! I am always looking for new smoothie recipes to try. I love to start the day with one. I will have to get the ingredients I need to make this on the weekend. There is just something about a smoothie that makes you feel better. I bet this one would do the same. I am definitely going to have to give this a try. It looks so delicious. I have definitely been meaning to make more smoothies. This looks amazing! Great recipes! We love smoothies at our house. It’s the perfect way to get in all our fruits and veggies in one big smoothie. I could use something like this! I am trying to find ways to get more fruits and veggies in my diet! This is a perfect way to do that! Whole Juice Smoothie provides all nutritions to kids. It is a complete diet. Thanks for sharing the recipe.